FileMaker 14 introduces new controls available in the mobile FileMaker Go app that help to bring the media player experience in FM Go more in alignment with iOS. These changes, compatible only with FileMaker Go 14, include 3 new script steps, 3 new script triggers and 1 new calculation function. 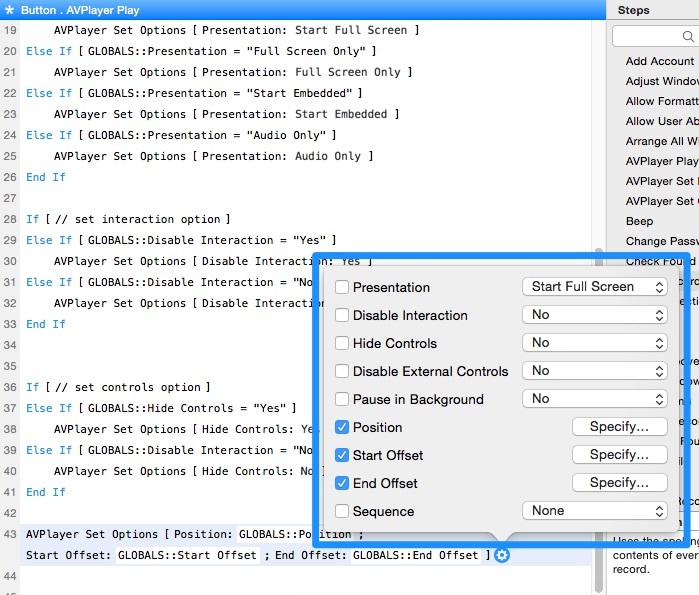 In addition, the script step Insert Quicktime has been removed (developers should use the Insert Audio/Video script step, which we have had since FileMaker 12). This is a great set of features to add to FileMaker Go, opening up the possibilities for a high degree of control over the way media is presented from a FileMaker custom-built application. Imagine, for example, creating a Video Training solution, with complete control over content delivery, plus granular tracking of user progress. Or a Content Management System for your users that need to collaborate around multimedia content and related data. As you would expect, each of these features is documented in the FileMaker Pro help menu. In the Help menu, select “FileMaker Pro Help”, then click “New features in FileMaker Pro 14.” Rather than just regurgitate the Help documentation, I thought it would be more useful to provide a working file that implements some of these features. I say “some of these features” as there are tons of options for these script steps. The file will at least give you a platform to start playing with them. I created a FileMaker solution file. Then, I added some video content and created some global options fields and a playback button. Note however that these features will only run on FileMaker Go 14, so you will have to open it on FM Go 14 by either transferring the file to an iPad or hosting it via FileMaker Server 14 or FileMaker Pro 14. Note regarding the file: Many of these new features interact with each other, so some selections for settings that you specify in the file may conflict. Let me know what you find in the comments! I learned a few things about the subtleties of these new features while setting up this file. First off, the AVPlayer Set Options and the AVPlayer Set Playback State script steps only acts on media that is already playing or paused. Since script execution seems to occur faster than the response of iOS playback, I put a short pause in the script, configurable in a radio selection for Script Pause. This represents the length of pause after the media playback starts before the other selected options are applied with the AVPlayer Set Options script step. You will notice that if you select 0 or .1, the other options to do not work. It seems like 0.3 seconds is the minimum so that the next script step can act on the media play back. Try using 0.7 seconds just to be sure. I bet the various versions of the iPad and iOS will perform differently. Check out the script “Button . AVPlayer Play” to see how I implemented this. This allows us to set an option or options with out disturbing other options that have been previously set. To that end, I am setting the Position, Start Offset and End Offset together in one script step. See the script “Button . AVPlayer Play” to see what I mean. Ok, as I said previously there are vast number of options to explore with respect to the new media playback features. Let’s stop here for now and pick up the discussion in the comments below. Looking forward to your feedback!